With today’s opening of Skyfall, the 23rd in the famed and long-running James Bond series, and last year’s passing of one of the all-time great film composers, John Barry (1933 – 2011), you’ll understand why I originally sought one of these ‘forgotten’ posts out. Besides, film reviewer/blogger Tony Dayoub wonderfully highlighted this, the fifth, OO7 film earlier in the week and helped spur this updated reprise. 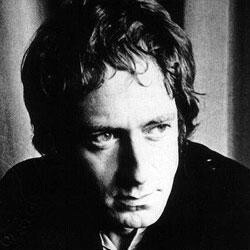 John Barry Prendergast scored so many memorable films throughout his well-recognized four-decade career. This included The Lion in Winter, Midnight Cowboy, Body Heat, Dances with Wolves… ah, hell, if I’m to mention that one, I’ll even list the splendid one he did for Out of Africa here. And I don’t even like the film, outside of its music and Streep’s performance. A number of the tributes after his death covered many of the prominent tracks associated with this extraordinary film scorer. I’d recommend salutes by authors John Kenneth Muir and Steven Hart, along with those of blogging colleagues christian and the ever-generous Ruth. They highlighted why this famed English music arranger/composer mattered so heavily in cinema. The sheer variety of movies he created music for, as many rightly point out, remain a spectacular testament for his talent at producing distinct melodies which literally shaped our thoughts musically when it came to motion pictures. This was particularly true for the iconic James Bond series. Think about these details: John Barry scored 12 out of the 22 OO7 films completed when he passed away. He was involved musically in the first seven movies (from Dr. No to Diamonds are Forever) and worked with the soundtracks in the decades bridging the 60s, 70s, and 80s. His last score in the series being The Living Daylights in 1987 (a film I re-watched again just last weekend). And his sweet sounds spanned the stints of Sean Connery, George Lazenby, Roger Moore, and Timothy Dalton in the lead role without missing a beat. Simply, his impact on the franchise (and in film music history in general) cannot be minimized. Looking back, I think I’ve missed his presence, of those who’ve left the Bond series, the most. It certainly was not a surprise the series’ producers wanted to fall back on that legacy with the new film. Listening to Adele’s excellent efforts with the Bond theme song for Skyfall (written by the singer and producer Paul Epworth), the 23rd variant followed in Barry’s well-worn sweet-sounding steps. Now, you can have arguments Galore (note how I subtly slipped in that Goldfinger character reference) for the greatest ever OO7 theme song (see what Google returns for that question). Better yet, just check out those I most respect on the subject of Bond, Fogs Movie Reviews, John Kenneth Muir or Flixchatter, for that matter. And for the sake of everyone’s sanity, let’s filter out the worst of them for this as it doesn’t pertain to the matter at hand. As I’ve said more than once, Madonna’s attempt with Die Another Day persists as my choice for the prime Bond song stinker — even Lulu’s rendition for The Man With The Golden Gun sounds good next to it. There, I said it. 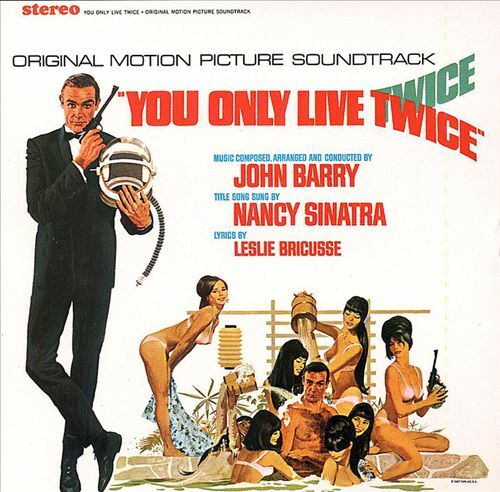 I call attention to Ms. Sinatra’s performance of the title track to 1967’s You Only Live Twice. Naturally, John Barry came up with the song’s distinct musical arrangement, with lyrics by Leslie Bricusse. I think what makes it worth remembering, and continues to set it apart, were its combination of singer and the richness in the composer’s melody. Nancy Sinatra didn’t have what you’d call a lasting career. But, when your dad was ‘The Chairman of the Board‘ you’re going to a) get noticed in the music world, b) be dismissed almost immediately by failing in the comparison to Ol’ Blue Eyes, and c) have it all happen almost simultaneously. It was a tough assignment. Still, her voice was more than satisfying, and tailor-made for the time. There were plenty of one-hit-wonders out there who’d kill for the number of moderate to well-known hits in her discography. These Boots Are Made for Walkin’, Sugar Town, and Somethin’ Stupid would be the stand-outs. Hell, Quentin Tarantino certainly recognized Nancy’s overlooked talent. Her cover of Bang Bang (My Baby Shot Me Down) was famously snatched from obscurity and re-used decades later for KILL BILL Vol. 1. Although, her selection for the theme song duties in such a high-profile movie during the 60s would lead you to suspect being Frank Sinatra‘s daughter had something to do with it. However that minimized the fact she handled the gig more than well. That and she had that boot thing going for her way, way before Kalinda ever did on The Good Wife. I freely admit I’m very partial to this theme track (in actuality, it’s third in my Top Ten for Bond songs). I’ve selected to highlight the original soundtrack version below. Though if you’re curious how that single cut sounds in semblance, you can sample it here. It’s not bad (just not great). While the song and Nancy’s performance hold up fine by themselves, I believe it works even more harmoniously when seen on the big screen. It’s the prime reason the theatrical version remains superior. Even though the film is argued over as one of the lesser Connery ‘Bonds’ (Tony rightly points out: “… it goes off the rails with the introduction of Connery made up as a Japanese fisherman.“), You Only Live Twice still retained some notable aspects. Two for sure were Blofeld’s Volcano headquarters, #1 in JKM’s Top Bond Villain HQs, along with a climatic set piece that beats them all in scale, action, and stellar execution. Both literally stand out in the OO7 series, still. With some of Barry’s best musical work, visually composed by the legendary film designer Maurice Binder, its opening title sequence remained a cut above most in the line. So, with a tip of the hat to Mr. Barry and Nancy, I hope you enjoy this musical reprise on this day*. * don’t get me started on sampling and what Robbie Williams did with this song. I’m not as high on this one as you are. I definitely love the little melody for it, but the verses are a little lame (though not due to Sinatra’s singing as much as the bland melody of them and the lyrics). And the quasi-asian stuff going on in the background never appealed either. So glad to have your thoughts on this, Fogs. Yes, “Rappelling Ninjas with machine guns!” is one of those things that’s been plastered on my Wall of Awesome since ’67. The other thing I love was how the producers worked in the tried and true ‘weapons and training’ sequence that we saw in previous films (done for both MI-6 and S.P.E.C.T.R.E.). More awesome stuff ;-). Thanks, Dan. Oh, and yes, the weak point in the song are the lyrics. Barry’s melody and Nancy’s vocal are the strengths, though ;-). “To be clear, I don’t have problems with other artists covering these songs. In fact, Santana did a wonderful update of this song that I really admire from 1978. It’s the so-called sampling that’s been going on that I have issue with. In another ten years, I’m pretty damn sure label producers will be thrilled that folks my age will be hard-pressed to recall the old tunes that they’ll continue to lift for their music sales while barely giving lip service toward the original — but at least I’m putting a thought down on this today. We can agree, I hope, that this theme was a timeless example of John Barry’s work. Thanks very much for reading and the comment. I have a lot of Nancy Sinatra albums. What can I say…she’s sassy. I also follow her on Twitter, where she is one of the most adept celebs I’ve seen on social media. I agree that her version works better when you’re watching the film though. Speaking of Robbie Williams, in one of those weird happenstances, he and NIcole Kidman covered “Somethin’ Stupid.” That CD isn’t too bad in my opinion. He liked to tap into both the Ol’ Blue Eyes and the 007 archetypes. Great to hear from another Nancy Sinatra fan. I’ve heard she’s quite active on Twitter. And one can’t go wrong with tapping “… into both the Ol’ Blue Eyes and the 007 archetypes.” Thanks very much, Paula. Thank you very kindly, Sergio. Oh, yes. This is much less memorable. I do get a sense there’s an attempt at recreating Dame Shirley’s approach with her ‘Goldfinger’ effort, modulated, of course, with an undertone of traditional Japanese notes. It just doesn’t work. Then, or now. This makes me appreciate Barry’s and Nancy’s theatrical cut that much more. For me, the credit sequence is a wonderful joining of contrasts (musically, you’ve got American pop, Asian influences and then a string-heavy orchestra–all of which still sends shivers up my spine; visually, it’s fragile umbrellas, soft geishas and bubbling lava), all of which, presented after Bond’s “death,” creates a hallucinatory/opium dream feeling letting you know all bets are off and things will get bonkers. Here’s where I tend to veer away from most Bond fans: while I love Donald Pleasence as an actor (you MUST see “Wake In Fright”!) and a villain; I just don’t see him as the head (that is, the founder, CEO, chairman and president) of SPECTRE. Splendid comment, Ivan. You’ve described the opening sequence brilliantly. All those distinct segments add up to more than the sum of their parts. True, as well, how producers enjoy ‘killing Bond’, only to hide and resurrect him. I need to check out that Derek Meddings’ commentary (‘Moonraker’ has another of my favorite songs, by Dame Shirley, and villain in Michael Lonsdale). You’re right. I must finally watch ‘Wake in Fright’. Good news, I see it’s finally coming to Region 1 in January. I remain a big fan of Donald Pleasence, and this Ted Kotcheff film I’ve never seen. And I’m a long-time fan of ‘The Eagle Has Landed’, especially for its extraordinary character actor work (Robert Duvall and Donald Pleasence stand out as Germans’ Colonel Radl and Himmler). I think you’ve fairly convinced me with your argument. Love that music link! Nancy in fine form (that “Sgt Pepper-esque freak out in the middle” described it well). You can come here and rant like this anytime, my friend. Thank you very much, Ivan. In reviews I’ve read about Skyfall, they all seem to highlight the fact that they are using the original Bond theme again. John Barry has helped make Bond who he is. It’s the gadgets, the women, and the music. Yeah, that’s true. And it accompanies an iconic prop when Barry’s music shows up in SKYFALL. I have heard Moby’s version. Not bad. Thanks for joining in, Marianne. …You Only Live Twice was teetering on the edge of my Bond top 10…then I saw Skyfall and it was knocked down to no. 11. One of the great Bonds and Sean Connery’s last really good hurrah in the role (although I do like Never Say Never Again).